Place a few drops of peppermint essential oil into a spray bottle. Add a squirt of liquid detergent and fill the bottle with water. Spray the mixture on cobwebs, around doors and windows, around the lawn and garden and on any surfaces where spiders lurk. In addition to having a pleasant aroma, this mixture is nontoxic and safe to use around children and pets. The combination of coconut oil and white vinegar also makes an effective spray for repelling spiders. As oils may stain or cause spots, test the mixture on a small, hidden area of carpets, curtains or upholstered furniture. Spiders taste through their feet, and in addition to peppermint…..they do not like the taste of citrus which includes lemon, lime and orange. Although it will not kill them, it will make them avoid places where they can “taste” them. Always purchase real essential oils and not synthetic versions. Spiders thrive in dark, cluttered places, so keep stacks of debris, woodpiles and thick plant growth away from the sides of the house. The fewer places spiders can easily inhabit, the more effectively they can be repelled. Seal cracks in the foundation and close gaps in windows or beneath doorways to deny spiders access to the premises. Mix equal parts white vinegar and water in a spray bottle. 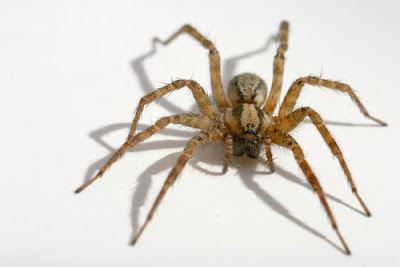 Apply it to any area in which spiders gather and spray it directly on any spider you see vinegar contains acetic acid, which is thought to burn and kill spiders upon contact. You can also place small dishes of vinegar in dark corners to ward away spiders. The odor alone may be enough to repel them. And last but not least….an all natural homemade insect repellent that should help out with all of the above!